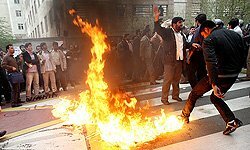 Iranian protesters in the capital, Tehran, have broken into the UK embassy compound during an anti-British demonstration, reports say. The protesters are said to be militant students. They are said to have removed the British flag, burnt it and replaced it with the Iranian flag. Protesters who carried photographs of Iran’s assassinated nuclear scientist Majid Shahriari and IRGC Quds Force Commander Major General Qassem Soleimani, set fire on Britain’s flag. The protesters were also shown live on Iranian state TV throwing stones at embassy windows and breaking them. Hundreds of Iranian university students started a rally in front of the British embassy in Tehran Tuesday afternoon to shout protest against London’s hostile policies against Iran. The rally comes as Iran is commemorating the first martyrdom anniversary of its nuclear scientist Majid Shahriari who was assassinated by the Israeli Mossad agency supported by the British MI6. The move comes after Iran resolved to reduce ties following the Britain’s decision to impose further sanctions on it. AP reported that students clashed with anti-riot police and chanted “the embassy of Britain should be taken over” and “death to England”. “Down with Britain”, “Down with America”, “Down with Israel” and “Students are Awake and Hate Britain” are among the slogans chanted by the protestors. One protester was reported to be waving a framed picture of Queen Elizabeth II. On Sunday, Iran’s parliament voted by a large majority to downgrade diplomatic relations with the UK after the British Treasury imposed sanctions on Iranian banks the previous week, accusing them of facilitating the country’s nuclear programme. The Iranian legislators approved the bill with 179 yes votes, 4 oppositions and 11 abstentions. The 4 oppositions demanded a full cut of ties with London. Iran says its nuclear programme is for peaceful purposes only. The Guardian Council – a powerful vetting body tasked with studying parliament approvals to make sure they are not against Islamic rules and the Constitution – announced its approval over the parliament ratification yesterday. As the parliament approval calls for downgrading ambassadorial ties with Britain to the level of charge d’affaires, Tehran is now preparing to expel the British Ambassador to Iran Dominick Chilcott. Chilcott took his post as the new Tehran ambassador in October and after several months of tension between the two capitals. The British embassy was meanwhile led by the charge d’affaires, Jane Marriott. The parliament approval came a week after the US and Britain targeted Iranian financial sectors with new punitive measures, including sanctions on Iran’s Central Bank and petrochemical industry. The sanction against CBI and Iran’s petrochemical industry was adopted in a unilateral move by the US, Canada and Britain outside the UN Security Council as other council members, specially Russia and China, had earlier warned against any fresh punitive measure, including sanctions, against Iran. The British government has also embarked on delisting the anti-Iran terrorist Mojahedin-e Khalq Organization (MKO) from its list of terrorist groups.